What’s the connection between grandmothers and this set of numbers? It’s called a Russian doll and the way all the smaller dolls pack inside the largest doll reminds me of the way all the smaller numbers 1 to 1010 pack into 1001010111000. 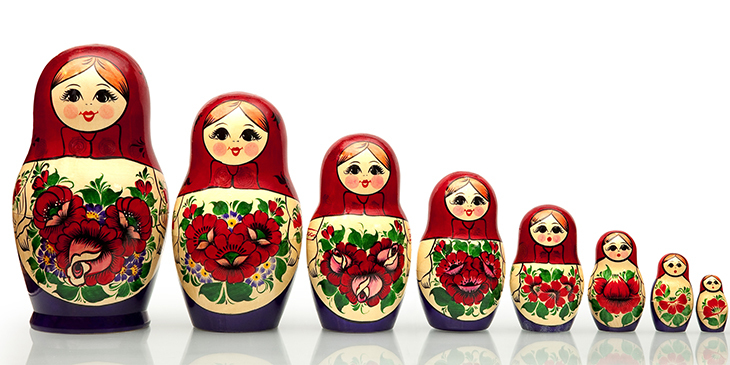 But in the Russian language, as you might expect, Russian dolls aren’t called Russian dolls. Instead, they’re called matryoshki (матрёшки, singular матрёшка), meaning “little matrons”. However, there’s a mistaken idea in English that in Russian they’re called babushka dolls, from Russian бабушка, babuška, meaning “grandmother”. And that’s what I thought, until I did a little research. What happens in higher bases? Watch this space.